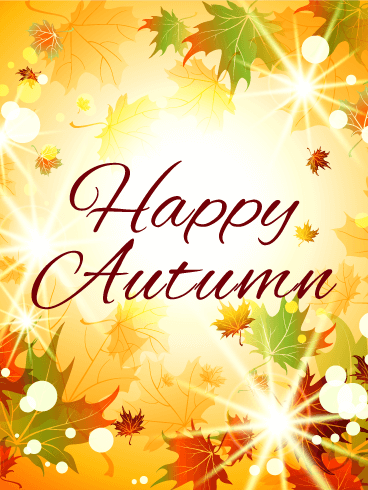 Send Happy Autumn wishes to someone dear to you with this wonderfully designed vibrant leaves Autumn card. The colors are perfect for the season, and will remind them that Autumn is here! This Autumn card features leaves of different shapes and sizes that form a creative border, nicely framing the most important part of this card, the words Happy Autumn! So send this Autumn card out soon to let someone know you are thinking of them. Autumn is a beautiful season, a good reason to remind someone of just how pretty it can be, and this Happy Autumn card will do just that. It shows the leaves change to wonderful shades of red, orange, and yellow during this time. Happy Autumn is framed perfectly and features a ray of light behind the lettering, so pretty! 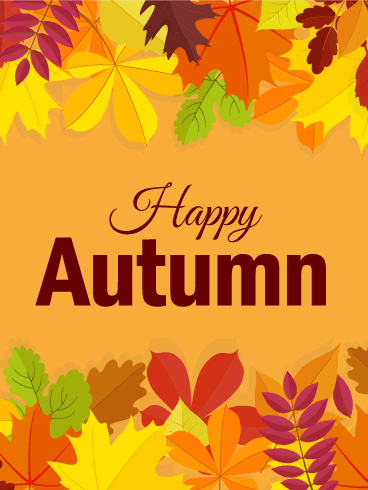 Send this Autumn card today to wish someone a Happy Autumn and remind them of what nature has to offer. 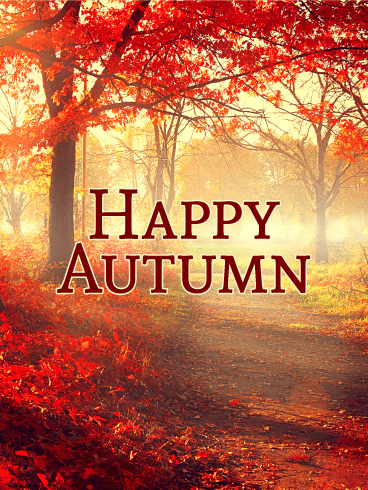 This shining leaves Happy Autumn card will definitely add some sparkle to someone's day! With bursts of light shining through Autumn colored leaves of red, green, and orange, this Autumn card is the perfect choice to start off the season. The Happy Autumn lettering in front of the beautiful bright light makes this message the focal point of the card. 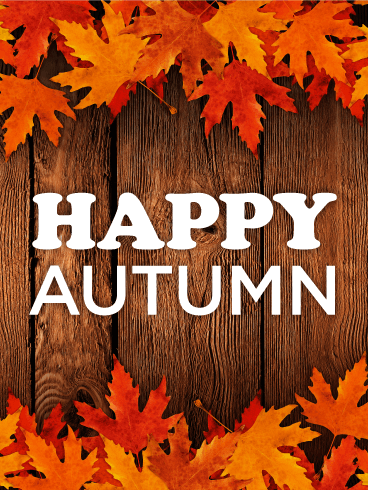 Send this special Autumn card off to someone you care about to bring some joy to their day! Have you been looking for a reason to do something nice for a friend or loved one, well now you have one! 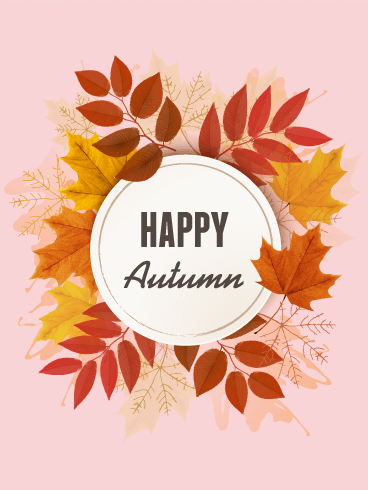 Autumn is here and there is no better time than now to wish them a Happy Autumn with this pretty leaves Autumn card. The colored leaves wonderfully surround the words Happy Autumn so it's the first thing they will see. Send this thoughtful card out today, you will be happy you did! Autumn is a gorgeous time of the year, and that's why this Red Maple Leaves Happy Autumn card is so fitting for the occasion. The Autumn card features lovely shades of red against a dark brown wooden background, with a highlight of white that displays the words Happy Autumn. 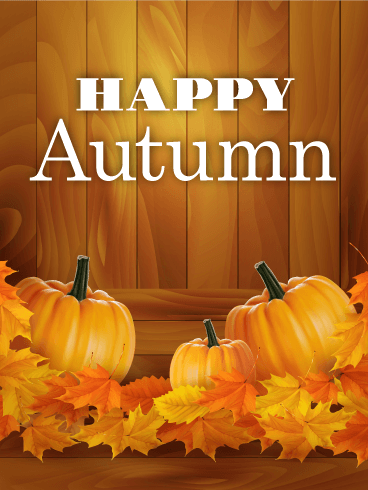 It would be appreciated by any friend, loved one, or co-worker, so don't hesitate, send this wonderful Autumn card to someone special!